Scheduling – The biggest part of meeting customer expectations in garden maintenance is showing up when you say you’re going to show up. As your landscape businesses grows and you add more employees, it becomes increasingly easier for jobs to slip through the cracks. I’ve had more than one client tell me that, before deploying SortScape, they had lost a few clients simply because they forgot to go to that client for a few weeks! When they finally realised the mistake it was too late – the client had already gone to a competitor. OUCH!!! This is why we focus so much on scheduling within SortScape. Customer request tracking – Customers also tell us that, before deploying SortScape, their customer requests would frequently slip through the cracks as well. For example, Employee A would be on site where the customer, Mrs Johnson, asks him to trim a large tree on the next visit. On the next visit, Employee B comes instead and doesn’t bring the proper equipment to trim the tree. Mrs Johnson gets frustrated because her requirements aren’t being met. It’s natural to forget things…our brains aren’t designed to hold all the information constantly being thrown at us. That’s why SortScape lets you log customer requests (called issues) from anywhere so that you can handle a variety of customer requirements without forgetting. A staggering 74% of organisations are using consumer-grade phones and tablets while another 48% say they use a rugged-grade version of the same. 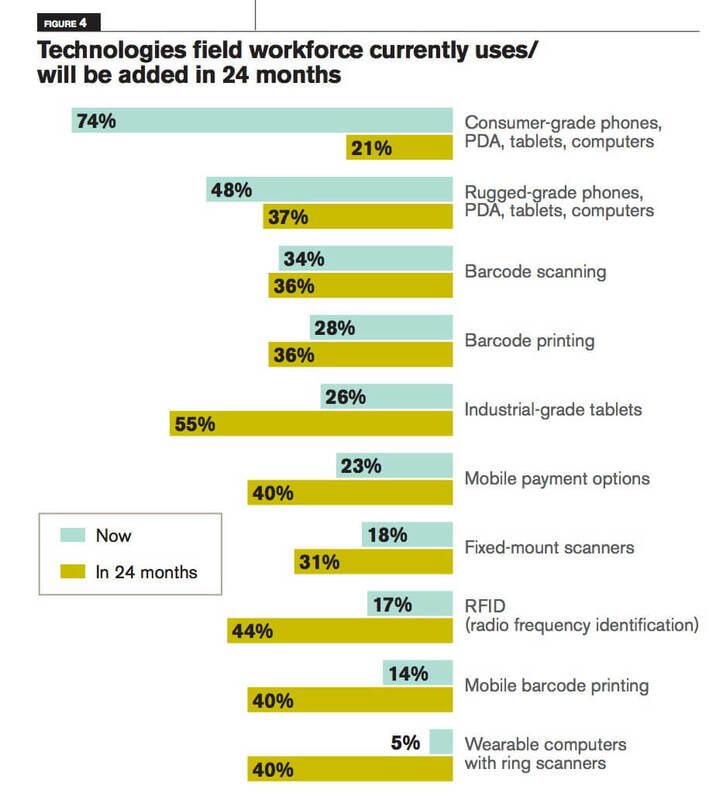 The survey mentions other types of hardware but it’s difficult to see a case for RFID, barcode scanning or barcode printing as it pertains to the landscape maintenance industry any time soon. Within landscape maintenance organisations I expect to see further adoption of consumer grade and rugged-grade phones and tablets for communicating and accessing cloud-based applications like SortScape. 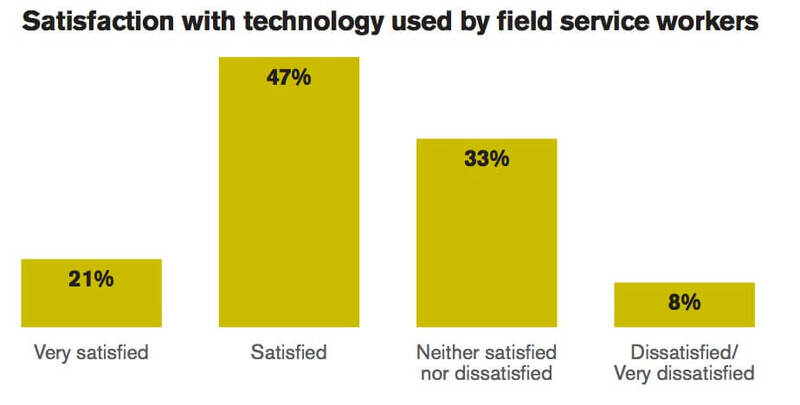 A huge chunk (80%) of respondents were either “satisfied” or “neither satisfied nor dissatisfied” with the technology used by their field service workers. Of course SortScape customers would all be in the “very satisfied” camp 🙂 But seriously, this is further evidence that the consumer and ruggedised hardware being used is adequate…adequate but perhaps not very exciting. I’d be interested to know more about what respondents consider to be “technology” and what technologies they were most/least satisfied with. Honeywell and Peerless don’t give much detail here. 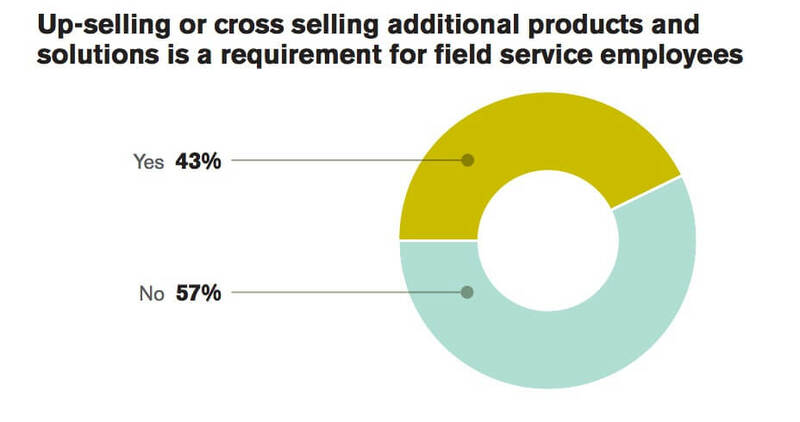 Less than half of survey respondents (43%) actually direct field services employees to sell. This is both unsurprising and surprising to me. It’s unsurprising because most SortScape customers don’t direct their field employees to sell or identify selling opportunities. It’s also surprising because it seems like an obvious opportunity for landscape maintenance businesses to grow sales. There’s a fixed cost to getting field employees to the job site so any incremental business they generate onsite would be highly profitable. 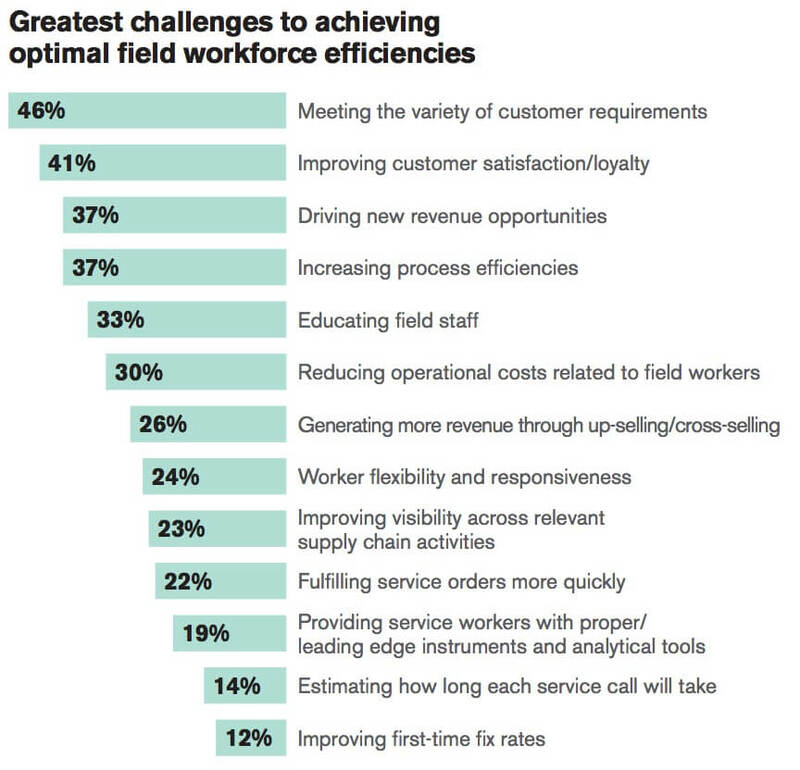 Field services software like SortScape would be ideal for for identifying and tracking upsell opportunities across the customer base. Surprisingly none of our customers have asked for this capability yet. Perhaps this is a level of sophistication they simply haven’t yet reached. The most obvious areas where Internet of things will impact landscape maintenance are in vehicle management and home automation. Businesses will have increasing control and insight into when and how their vehicles are being driven. For example, for USD$129 you can buy a small Automatic device to place in your car which streams data about you vehicle directly to your phone in real time. At this cost every field services organisation could/should be tracking their vehicles in real time on the phone. Home automation is another area that will landscape maintenance businesses…outdoor irrigation systems and outdoor lighting systems will become increasingly more intelligent and connected. Customers will expect their gardener to be able to service and monitor them.